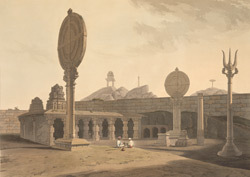 Plate 18 from the fifth set of Thomas and William Daniell's 'Oriental Scenery' called 'Antiquities of India.' The temple depicted by the Daniells has been identified with the Gangadharesvara temple near Bangalore, which is entered through a columned hall preceded by a courtyard with four monolithic granite pillars. Two pillars are carrying large discs representing the sun and moon. Another pillar is topped by the trisula or trident, emblem of Shiva. The artists were fascinated by the singularity of these symbols.